A few days ago I flew home from Adelaide, having attended the first College of Bishops meeting for the year. One of the first things I do when I get to my seat in the plane is to decide what, if anything, I’m going to watch or listen to during the flight. On this occasion I decided I didn’t want to wear the headphones, but would rather simply ‘watch’ something without them. There’s a good reason for this. Headphones make my ears get hot and go red. I don’t like that sort of thing happening much, and I didn’t want it to happen on this particular day! I chose a replay of the Rugby World Cup Final from last year (just in case readers of this update need a reminder, the final score was: All Blacks 34; the other team 17). I watched it without any commentary. No words; just pictures. I reckon it sort of fits in with what a lot of sportspeople when they tell us they’re going to let their actions on the field do all the talking. It was a really interesting thing for me to do. I think I saw more of the game, more of the detail and intricacies of what was going on without words. I had to watch carefully to see what I needed to see, because there was no one telling me what it was that I was seeing (if that makes sense). I lost nothing of the excitement of the game, and I felt equally a part of what was going, albeit without words. I even cheered a bit, punched the air once or twice (I think the people sitting behind me knew what was going on) … and even though there weren’t words, I just loved Ma’a Nonu’s and Beauden Barrett’s beautiful tries all over again. You just don’t need words for that sort of thing! Lent seems to me to be the right season for fewer words. Lent seems to me to be the ideal season to allow other things – images, pictures, scenes – to speak, rather than words. It seems the perfect season for fewer words, less commentary … a season for quiet reflection … for looking and seeing … for “beholding the Lamb of God who takes away the sin of the world” (John 1:29) … for just beholding him … not talking or speaking, no words … but just looking at him intently with our hearts, and taking it all in. On Ash Wednesday you were marked with the cross. Words really weren’t needed. There was enough in the grainy ash … the roughish mark on bare skin … the outline of the shape to know what was going on. The cross doesn’t really need words, does it? It speaks of its own accord. Years ago for Good Friday worship we simply walked the various Stations of the Cross … images … some words, but few, from scripture … just to set the scene. And then we let quietness and stillness before those images, and the Holy Spirit do its thing … speak to us at a different level … speak to the heart. The final station was the draped crucifix. It didn’t need words. It spoke without words. The figure of Jesus, head draped, crown of thorns, hands stretched out … in love for you and me. No words needed here, and yet it cried out a beautiful message … a simple but profound message from God: I LOVE YOU. My prayer is that you find enough time and space this Lent to be without too many words … to be still in the presence of God … to be still before the images of cross and thorns and out-stretched hands … to behold the Lamb of God. Paul asks this question of the Galatians, "What happened to all your joy?" (Galatians 4:15). He's clear: "It was for freedom that Christ set you free" (Galatians 5:1), and he asks elsewhere "Would you say, then, that he who so lavishly sends the Spirit to you, and causes the miracles among you, is doing this through your practice of the Law or because you believed the message you heard?" (Galatians 3:5). These are really important questions, touching on truly fundamental issues of Christian experience. Can we see anything of ourselves in them? Is it too much to expect God to refresh us in his joy, confirm us in our freedom and lavish his Spirit upon us afresh? We believe not. Reanimate our sense of mission. We'll be using Galatians as our case study, and through its pages God will hold a mirror up to ourselves; not to highlight our faults and failures, but to enjoy the Light of Jesus as our Father shows us who he is and what he's doing. This year, Pastor Noel Due, Mission and Support Pastor for the SA/NT District of the LCA will be our presenter. In less than a year, we plan to begin our commemoration of the 500th anniversary of the Reformation at Te Whakuru on the north-eastern tip of the Chatham Islands, where the first Lutheran missionaries to New Zealand, from the Gossner Mission in Berlin (read about them later in this update) established their mission. The Working Group will soon have the various price options for travel and accommodation for this event available for you. If you are interested in coming to the Chatham Islands and receiving information could you please contact me as follows? Making the most of the last weekend of the summer holiday, approximately 45 members of St Paul's Lutheran Church in Wellington skipped their typical church service. But it may not be what it seems, they were away attending the much planned and anticipated Summer Church Retreat on the Kapiti Coast. The retreat was held at El Rancho, the Waikanae Christian Holiday Park. They provided not only amazing facilities and rooms, but also three quality cooked meals a day and fully staffed youth activities. Nice touches of the venue included the mini-golf course being full of Christian symbols, a Chapel on site, and Bibles in every room. The organizers at St. Paul's ensured every member had the opportunity to attend regardless of their means. Many members of St. Paul's worked hard to plan and promote the retreat. Spiritual activities included spending a good deal of Saturday immersed in a topical Bible study on Ruth. This was followed by a guest speaker, Caroline Preston, working with Red Cross connecting Ruth's experience to those of international refugees and a call out for assistance. Each sunrise offered up a Morning Prayer meetings and nature walk for those early risers. Organized actives such as ice breaker games, a talent show, obstacle courses, a football game, bush craft, and swimming brought together those from all ages. A standout activity was the facilities new waterside enjoyed by both the spectators and the slide goers. The retreat finished up on Sunday with a Communion Service including the debut of a new member of the church musical troupe (way to go Andy Knackstedt!). It began with an idea and moved quickly to a very special day for our senior members. Individually hand printed invitations followed. “Honouring our 80s” was the title given to a special celebratory afternoon tea party, organized by St Pauls Leadership Team. 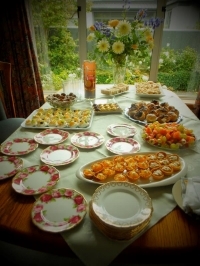 It was a time to serve superbly presented food and use the best Royal Albert bone china cups, saucers and side plates. It was the day to be waited on hand and foot and the day to spend chatting and reminiscing with friends from way back. With Pastoral Leader Ahi praying for our seniors to continue their daily walk with our Saviour, it was such a treasured time for everyone. And now it is a warm memory. Our big group of eighty+ year olds felt a wonderful sense of belonging. What came next? We decided to keep on treasuring our seniors – those who have given their days and lives in support of our church – and those who haven’t been here so long. Recently Carl Christensen reached his 86th birthday and it was time to celebrate a senior again. We held a special birthday party for Carl. Carl is one of our revered seniors at St Pauls and has links with the Lutheran Church that go way back to his early days in Christchurch. His father helped to build the second St Pauls church building in Montreal Street, the building that later became the hall, when the new church was built next door in the 1960s (where the Chch Art Gallery now stands). During his long association with the church he has occupied a number of different positions, including time spent on the LCNZ National Church Council and various offices in the local congregation. A recent fall at home saw Carl hospitalised, but his determination to walk again won through and he is now cheerfully attending worship again. You are invited to attend the unveiling of a Memorial Cairn at site of the former St Johns Lutheran Church in Kimber Street, Halcombe on Sunday 17th April at 2.00pm. At this stage I haven’t given any thought to whether we might be able to arrange a simply cuppa after the Rite of Unveiling; if I can organise something, I’ll let you know in the next update. Luther500 is an international theological conference on the theology of Martin Luther. It is being held to mark the 500th anniversary of the Lutheran Reformation (in 2017) and intends to explore, positively and critically, the reception of Martin Luther’s theology today and its significance for Christianity in the future, particularly in ecumenical and global dimensions. The conference is being sponsored by Australian Lutheran College (University of Divinity) (ALC) through its research centre, the Australian Lutheran Institute for Theology and Ethics (ALITE). The conference will be held 28th June to 3rd July, 2016, at the Catholic Leadership Centre in East Melbourne. Luther500 will feature six international Luther scholars as keynote speakers, as well as eight other speakers offering shorter papers in elective sessions, including a number of our own ALC teaching staff. In order to assist attendance, we are offering, through a generous grant from the Lutheran Laypeople’s League (LLL), a limited number of scholarships (up to 20) for pastors, lay workers, and other eligible persons, each worth $300. Scholarship information and an application form will be made available on the conference website shortly. Scholarship applications will be due 7th March. For further information about the conference, please go to the conference website at www.luther500.com.au. Registrations are expected to open soon. Do you love working with children and families in a Christian environment? Are you looking for an opportunity to nurture and grow children in their faith journey? The Manawatu Lutheran Parish has a 20 hour (negotiable) position available. For more information please contact our Parish administrator for an application pack at manawatulutheran@inspire.net.nz or at (06) 3570030. Applications close on 4th March 2016 at 12 midday. This synod period (till the 2018 synod in Sydney) is being treated as a transition period for the various church governance and administration structures. GCC has already begun work on implementing the decisions made at the Brisbane Synod last year as a result of the LCA-wide governance and administration review’s 28 recommendations. The new Church Worker Support Department is currently being established and a manager, Dr Christine Materne, has been appointed. Two further appointments have been made to the new Board for Support to Pastoral Ministry with one more lay member still to be appointed. Of interest to NZ; Ray Meharg from Mountainside has been appointed to the Media Ministry Board. Ray’s appointment completes the new Board for this term. Last year’s General Convention passed a resolution affirming condemnation of all forms of family violence and authorised GCC to commit resources for a church wide campaign to address this issue. Bishop Henderson has received offers of help in this regard from some very highly qualified people which he and GCC members find particularly encouraging. General Convention passed two resolutions with regard to Ordination. One was a request to CTICR (Commission on Theology and Inter-Church Relations) to draft a doctrinal statement for the next Convention and, secondly, that the church enter a period of careful theological reflection and pastoral work ... to assist in maintaining its unity and harmony. The doctrinal statement is to present a theological basis for the ordination of men and women and show why this need not be church divisive. We heard that Australian Lutheran World Service (ALWS) has just been successfully accredited by DFAT (the Australian Department of Foreign Affairs and Trade); the report was very positive with statements including ‘a true heart for humanity’. Accreditation enables the ALWS to continue to enter into contracts with DFAT on development projects. The General Convention minutes are in the final revision stage and delegates can expect to receive their copy in the next few weeks. On the 1st March, my Review of Ministry will take place in Wellington, facilitated by Rev. Reg Weeks. (Reg is a Presbyterian minister and has served in many situations as a parish minister and also in regional and national appointments for the Presbyterian Church. He now resides in Wellington and runs CenTral Consulting). Some of you have participated in an on-line survey for the purpose of my review, and I want to thank you for taking the time to do this. The information that you have provided, together with my own written reflections on the tasks and responsibilities of Bishop, will hopefully make for a review process that seeks to affirm the things that I might be doing well, and to identify those areas of ministry where I need help in order to do things better. This process reminds me that I am your servant and a servant of the Lord of the Church who has called me to be Bishop. I ask you to pray for me – especially on Tuesday – that the Holy Spirit would continue to equip me with everything good for doing his will (Hebrews 13:21). In April I will be travelling, along with 5 other LCA-NZ pastors, to Germany at the invitation of the Department for Papua-Neuguinea, Pacific, East Asia / Mission EineWelt of Neuendettelsau, for a two-week long Study Program in Neuendettelsau. The Study Program will include study units such as Luther – Reconciliation and Justification, Wittenberg: Luther’s Life and My Faith, Empowerment by Learning, and Transformation and Christian Community. Some time will also be spent visiting historic ‘Luther’ sites (Wittenberg, Erfurt, and Eisenach). I plan also to plant a tree (sadly it can’t be an NZ native) on behalf of the Lutheran Church of New Zealand in the Luthergarten in Wittenberg (you can check this out at http://www.luthergarten.de/welcome.html). I have also been invited to be the guest of the Gossner Mission (the Mission that sent the first missionaries to New Zealand in 1843) in Berlin for 3 days, where I will meet with members of the Board and also with Margot Käßmann who is the Special Envoy for the Reformation anniversary' of the Evangelical Church in Germany. There is quite a bit of interest amongst these people in our planned Reformation commemoration on the Chatham Islands. From there I will visit Leipzig and stay with friends from Ensemble Nobiles who have been our guests in the LCNZ twice now, and who have offered to take me to concerts and services at Bach’s Church – Die Thomaskirche (St Thomas Church), and possibly a football game involving RB Leipzig. I’m hoping I might get to play the ‘new’ Bach organ in St Thomas as well. I will also visit Amsterdam for three days to meet up with the organ builders who built the organ for St Pauls in Wellington, and on the way home will call in on Pastor Tim Muller and his wife Mary in Columbus, Ohio (Tim is pastor at Ascension Lutheran Church there). I may get to play for a service or two there and Tim has asked me to share with his congregation about the LCNZ. I thank God for this opportunity to travel, to study, and to meet Lutherans in other parts of the world and share with them concerning life and ministry here in the LCNZ. I will be away from New Zealand from 20 April until 24 May. Haere i runga i te rangimārie i runga i te aroha me te ngākau hihiko ki te mahi ki te Ariki. Go now to love and serve the Lord; go in peace.